Acoustic Energy Aego Soundbar review | What Hi-Fi? What do you do when you have a small room, a small TV, and a small budget, but want a big, enjoyable sound? That’s easy: you take the Acoustic Energy Aego Sound3ar for a spin. Acoustic Energy is no stranger to delivering compact systems on a budget; the 2.1 Aego had a big impact with a small footprint when it was launched nearly a decade ago. 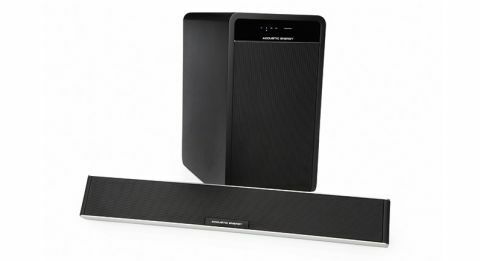 The new Aego Soundbar is similarly compact, comprising a small bar and a wired subwoofer for just £200. It may have a budget price tag, but the Aego certainly doesn’t feel like a cheap system. Other soundbars, such as the Q Acoustics Media 4 (£300), have a more solid, heftier feel, but the Aego’s aluminium build is sturdy and looks neat. The bar’s dimensions (just 50cm long and 7cm tall) are such that you can prop it right up close to your small telly or even desktop computer without obstructing the screen. The subwoofer is fairly compact (roughly the size of a bookshelf speaker), and can be tucked away under a desk. Don’t let the subwoofer stray too far from the bar, though, as it’s not wireless. The bar needs to be wired to the subwoofer (cables are provided), and all the connections and power are housed in the subwoofer too, so make sure it’s placed close to a power socket and your main TV or music source. Wireless subwoofers do extend a certain element of freedom, but the Aego’s set up shouldn’t be much of a hindrance as it’s designed for small spaces. There are only three connections on the Aego – optical, 3.5mm auxiliary and aptX Bluetooth – but they’re enough to connect up a variety of sources. Optical is likely to be the main input for your TV, the 3.5mm auxiliary lets you plug in music sources such as an MP3 player and you can wirelessly stream tunes from compatible smart devices and laptops using Bluetooth. That’s pretty decent for a compact budget system. Acoustic Energy helpfully provides all the cables you’ll need for each connection, too, which is a great touch if you’re on a strict budget. You also get a tiny, credit card-style remote whose basic controls (volume, input, tonal balance) are simple to use. Just remember to point the remote at the subwoofer, not the bar. The first thing you’ll wonder is: can such a small system really deliver a big enough sound to fulfil your mini home entertainment needs? The answer is: yes it can. Play John Wick on Blu-ray, and the spread of sound goes beyond the soundbar’s diminutive size. It does a decent job of showing off the large space of the nightclub where Keanu Reeves wreaks havoc, giving you a better sense of the atmosphere than your TV speakers would. Sure, you’ll get a grander and more enveloping sound through the longer Q Acoustics Media 4, but the Aego emits a surprisingly big sound for such a small bar. Integration with the subwoofer is decent as well, with a pleasing solidity running through the Aego’s presentation. The Aego is detailed enough to convey the change in space when the action moves to a smaller room. Dialogue is heard loud and clear, with enough body to make it a comfortable listen. However, it could do with more nuance and authority to fully flesh out voices – it feels like the Aego is skimming the surface detail here, rather than revealing every small detail. While we’d want more control and tautness to the bass – and you really can only hear the top end of the lower frequencies; it doesn’t go particularly deep – it has an eagerness that drives the overall sound. Basslines in music bounce along merrily, and punches land with a decent, if slightly soft, thump. The presentation is a touch forward though. Dialogue and effects are pushed to the forefront – but not in a way that grates. Whereas the thin, coarse sound of the Philips Fidelio B1 (a similar but pricier proposition at £450) wasn’t a comfortable listen after a couple of hours, we had no such issue with the Aego. The Aego is happy to tackle Keanu’s deadpan delivery in the same breath as raucous fight scenes. There’s enough separation between special effects and the pounding soundtrack, and to the Aego’s credit, it never sounds messy or confused. Yes, it could be more rhythmically precise (streamed songs don’t quite gel together and we’ve heard more musical results through the £99 UE Roll 2), and more insightful, but the mix of convenience, amenable sound and affordable price makes this a system that’s comfortable to live with. Spend another £100 and you get the Q Acoustics Media 4 – a significant step up in terms of detail, precision, dynamics and scale. But not everyone will be able to fit that long bar into their homes, nor be able to spare the extra cash. Acoustic Energy fills that gap neatly. The Aego Soundbar is a fuss-free, well thought-out product for those who want an enjoyable sound from their TV, but don’t have the space or budget to splash out for the big bars.